I was looking for an inexpensive holographic weapon sight to mount on a GSG-5. This lightweight carbine is a clone of the H&K MP5 in affordable .22 LR. So while I did not want to spend $500 for a range toy, I did not want something cheap that would fall apart within a few months. 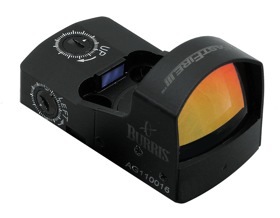 I selected the Burris FastFire because I have been using Burris scopes and sights since I entered the world of shooting sports almost 30 years ago. The company has never let me down in the past and the Fast Fire was no exception. The dot was bright and easy to acquire even in the bright full sun of the northern Sierra Nevada Mountains. It mounted directly onto a rail I installed on top of the GSG-5 and I was hitting the black in a matter of minutes. My one complaint was that the adjustment screws were a bit on the small side, but the fault could be with my oversized mitts and slightly aging eyes. As I mention below, this issue is only present on the FastFire II–the FastFire III is much easier to adjust. The weight of this sight is an imperceptible 1.5 ounces. I am considering installing one in the rear sight dovetail of a spare M1911 pistol as I type this because I have been so pleased with the performance of this sight. I am considering maybe a third as a backup holographic sight to one of my Trijicon scopes as the price is easily one third of that company’s RMR. This sight is currently available in two versions: the FastFire II and Fastire III. While the two models share many of the same features, the FastFire III (pictured) offers a variety of upgrades, including easier to use windage and elevation adjusters, multiple brightness settings, and simplified battery access.